Every bodybuilder finds himself up against this problem at some time during his training. He knows that all he has to do to improve his poundages in every exercise is to go on a power routine. 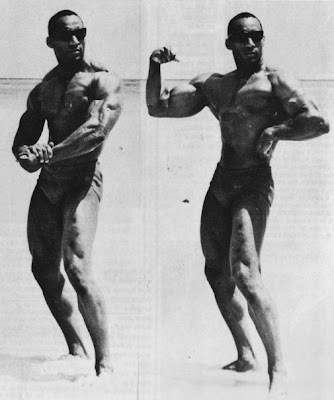 He hesitates to take this step, as he realizes that such a routine, while resulting in increased strength, could cause him to lose shape, separation and definition. It could be a set-back rather than an advance. How can he increase his strength without loss of physique shape and proportion? The “perpetual weight-progression” routine is the answer. 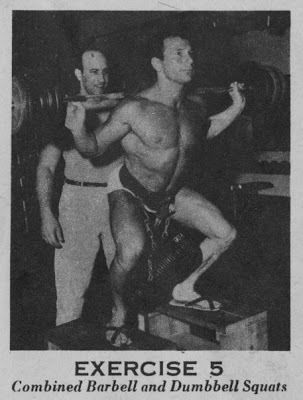 By its use, the lifter will find his training poundages increasing during almost every workout, and this tremendous increase in power will be brought about without any loss, but rather with gains in physical development. Choose any of your favorite basic exercises: the squat, bench press, curl, etc. You will perform three variations of each of these exercises, four sets of each variation each workout. In the squat, sink to the lowest possible position; hold for a moment, then rise, maintaining an erect, straight back, chest-out position. In the bench press, lower the bar to your chest; hold for a moment, then press without rebound or back arch. Perform the curl leaning backward against a wall or post, throwing the full effort onto the biceps, isolating the movement. Begin with a weight with which 6 repetitions are difficult. Increase the weight on the bar from 5 to 10 pounds a set, decreasing the repetitions by 1 each set. The 4th and last set of Variation No. 1 should find you fighting out a hard 3 repetitions. The second variation will be the basic exercise performed in a partially-limited (or less-strict) style. Use the squat on a bench after the full squat; in the bench press, use a rebound and a back arch after the strict style; perform the standing loose-style curl after the “leaning against wall” curl, etc. Begin with a weight 5 to 10 pounds heavier than that used for 3 repetitions in the last set of Variation No. 1. Perform a full 6 reps, beginning the process of weight-increase, repetition-decrease as before. A full 4 sets will find you performing a set of 3 limit reps at their conclusion. For your third and final variation, you will perform 4 sets of your basic exercise using a very limited or a very loose style. You will perform the 1/3 or quarter-squat after the bench squat; the lockout bench press from boxes while lying on the floor after the cheating bench press; the cheating swing-curl after the loose-style standing curl, etc., using a similar pattern for your other chosen exercises. In this final variation you will be using maximum poundages in the partial and cheating movements, thus building great strength and overcoming any “mental hold-back” towards the handling of greater weights. Begin with a weight 5 to 10 pounds heavier than that used for the 3 final repetitions in Variation No. 2, and begin again with 6 repetitions, raising your poundage and lowering your reps each set, ending with 3 reps in the last set. 1st set – 80 lbs. x 6 reps.
2nd set – 85 lbs. x 5 reps.
3rd set – 90 lbs. x 4. 4th set – 95 lbs. x 3. 1st set – 100 lbs. x 6 reps.
2nd set – 105 lbs. x 5. 3rd set – 110 lbs. x 4. 4th set – 115 lbs. x 3. 1st set – 120 lbs. x 6 reps.
2nd set – 125 lbs. x 5. 3rd set – 130 lbs. x 4. 4th set – 135 lbs. x 3. You will note that you have begun with but 80 lbs. and have finished the movement using 135 lbs. in one workout. Your style has become more loose, and thus you have limited the actual range of muscle contraction, permitting the use of greater weights – in this example 55 lbs. more for your 12th and final set than you used for the first set. 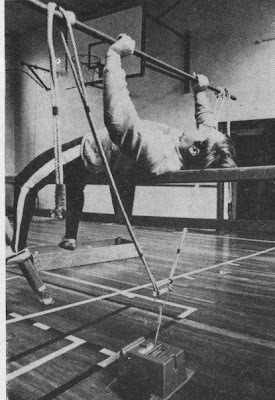 It is best to increase the weight of the bar by only 5 lbs. a set when performing an exercise such as the curl, which concentrates on smaller muscles of less strength than those of the back and legs. For the squat, bench press, etc, increase the weight by at least 10 lbs. a set. By increasing the weight of the bar by so great an amount during each workout, and by performing more limited, looser-style variations as your poundages progress, great physical power and tremendous confidence result. As each workout approaches, you will find yourself planning to use 5 to 10 pounds more for your first set of the basic, strict-form movement, and when your workout day arrives, you will actually perform a full 6 repetitions with this increased weight. A workout using this training method should consist of three to four basic exercises, done in the weight-progression style, and three to four regular movements, three sets each, if energy permits. Train three times a week for four to five weeks, or until your progress is noticeably retarded.